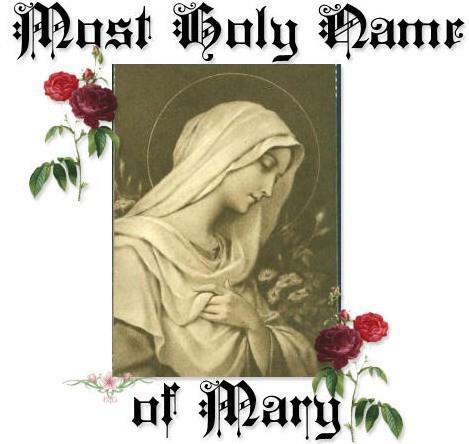 Sep 12 – Most Holy Name of Mary | ADULT CATECHESIS & CHRISTIAN RELIGIOUS LITERACY IN THE ROMAN CATHOLIC TRADITION: hosting ONLY True Christians!! !, or "How to think Catholic!!" In 1513, a feast of “The Holy Name of Mary” was granted by Papal indult [Pope Julius II] to the diocese of Cuenta in Spain. It was assigned with proper Office on September 15, the octave day of Our Lady’s Nativity. With the reform of the Breviary undertaken by Pope St. Pius V, the feast was abolished, only to be reinstituted by his successor, Pope Sixtus V, who changed the date to September 17. From there, the feast spread to the Archdiocese of Toledo  and, eventually, to all of Spain and to the Kingdom of Naples . Throughout this time, permission to celebrate the feast was given to various religious orders in a prudent manner as has been the custom throughout Church history regarding feast-days, their dates, offices, liturgical expression, etc. However, this Feast of the Holy Name of Mary would one day be joyfully extended to the Universal Church, and this on account of rather dramatic circumstances involving one of Poland’s great military heroes, John Sobieski [1629-1696]. While acting as field-marshal under King John Casimir, Sobieski had raised a force of 8,000 men and enough provisions to withstand a siege of Cossacks and Tartars, who were forced to retire unsuccessfully and at a loss. In 1672, under the reign of Michael Wisniowiecki, Sobieski engaged and defeated the Turkish army, who lost 20,000 men at Chocim. When King Michael died, Sobieski, a beloved hero at that point, was crowned King of Poland. But, even before his coronation could take place, he would again engage and drive back the Turkish hordes in separate battles including the raising of the siege at Trembowla. Once crowned, he advanced to the Ruthenian provinces, where, having too few soldiers to attack the Turks, who outnumbered his men ten to one, he literally wore out the enemy, garrisoning his troops at Zurawno. Because of this heroic effort, he was able to regain, by treaty, a good portion of the Ukraine. With both Turks and Poles weary from battle, peace reigned for a time . . . until the Turks set their sights on Austria, setting out through Hungary with an army of approximately 300,000 men. Fleeing from Austria, Emperor Leopold asked for Sobieski’s assistance, a plea which was seconded by the Papal Nuncio. In July 1683, the Grand Vizier Kara Mustapha had reached Vienna and laid siege to the city, which was being defended by only 15,000 men. Sobieski set out for Vienna in August, his forces marching behind the banner of the Blessed Virgin. Passing by the Sanctuary of Mary in Czestochowa, they implored Our Lady’s help and blessing. In September, the men joined with the German troops under John George, Elector of Saxony, and Prince Charles of Lorraine. On the eighth day of the month, the Feast of the Nativity of Mary, Sobieski prepared himself for the ensuing conflict by the reception of Holy Communion. Battle was engaged before the walls of Vienna on September 12, 1683, with Sobieski seemingly put to flight by “the fierce Turkish forces. However, this retreat was a minor setback only. The Hussars renewed their assault and charged the Turks, this time sending the enemy into a retreat. The combat raged on, until Sobieski finally stormed the enemy camp. The Turkish forces were routed, Vienna was saved, and Sobieski sent the “Standard of the Prophet” to Pope Innocent XI along with the good news. In a letter to the Pontiff, Sobieski summed up his victory in these words: Veni, vidi, Deus vicit —–“I came, I saw, God conquered!” To commemorate this glorious victory, and render thanksgiving to God and honor to Our Lady for their solicitude in the struggle, Pope Innocent XI extended “The Feast of the Holy Name of Mary” to the Universal Church. Although the feast was originally celebrated on the Sunday after the Nativity of Mary, Pope St. Pius X [+1914] decreed that it be celebrated on September 12, in honor of the victory of the Catholic forces under John Sobieski.